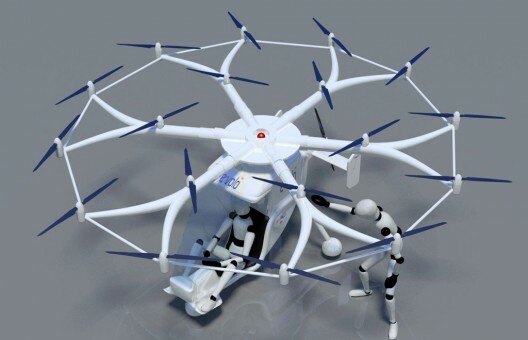 e-volo, the company that crafted the VC-1 16-blade ultralight helicopter last year, won the Lindbergh Prize for that accomplishment and for its ongoing development of the multi-rotor platform, with single, two-seat, and unmanned aerial vehicles in conceptual versions. Game Boy and X-Box players will find real flight a simple matter, according to the award, with the ability to “transition right from their smart phones and game stations to the Volocopter,” with its joystick control and intuitive fly-by-wire operation. The e-volo system controls flight direction and velocity through differential power to each rotor, eliminating the normal mechanical controls and getting the most from each miniature powerplant. Multiple small rotors also generate less noise than a more traditional vehicle. The Bose Corporation provided two QC-15 acoustic noise cancelling headsets to be awarded to the prize winning team. 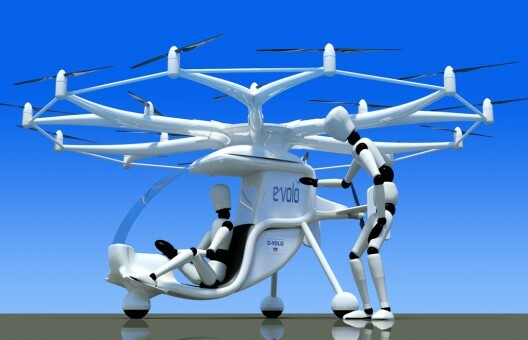 e-volo plans three paths for its future: a single-seat ultralight, 19-rotor vehicle; a two-seat VC Evolution 2P with a speed of 54 knots (62 mph), minimum flight altitude of 6,500 feet, takeoff weight of 450 kg (990 pounds) and the ability to stay aloft for at least an hour; and an unmanned version. The two manned versions shown have a tail rotor to provide additional forward thrust. e-volo’s two-year development plan calls for a collaboration with the LBA (German Federal Aviation Office) and the DULV (German Ultralight Aircraft Association). 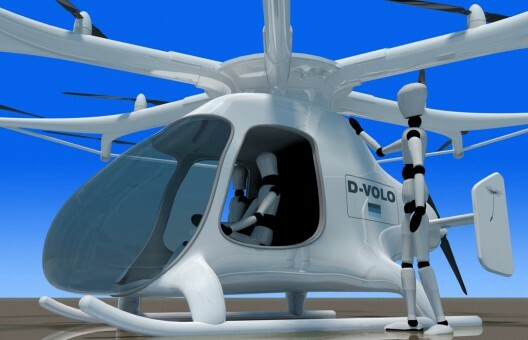 e-volo anticipates, “autonomous test flights over uninhabited areas for days on end… in order to test and demonstrate the reliability of the electronic steering and the diverse safety concepts in an uninterrupted flight.” The team also plans a UAV-type platform that could carry up to 200 kilograms (440 pounds). Such a device would serve nicely for inter-urban transport of goods. Such simple-to-fly, ultralight craft would have a place in the commuter market, especially if they could be manufactured for a reasonable price – something which seems reasonable in terms of the growing sophistication and economy of electronics. Am I the only one to notice that this 16 rotor vehicle has 19 rotors? As the sizes increase, so do rotor (actually, propeller) diameters, and thus the angular momentum of each propeller. The stability of the system depends on the rapid change of the angular velocity of each propeller based on the sensor readings. Therefore it will be more and more difficult to obtain stability for larger systems. In terms of stability, we can think of this like a conventional helicopter where the Bell-Hiller mixing is jammed. Quadrotors, as they are called in the RC airplane hobby, are widely used nowadays, and they all rely on light small propellers. The prototype e-Volo, to the best of my knowledge also used a similar technology. It will be an interesting design challenge to scale this up as desired for large scale transportation. Jim Horn and the editor both missed the obvious. Reread the first sentence, which provides a link to a photo of the 16-rotor VC-1, which flew last year. The rest of the article describes plans to build various 19-rotor vehicles.